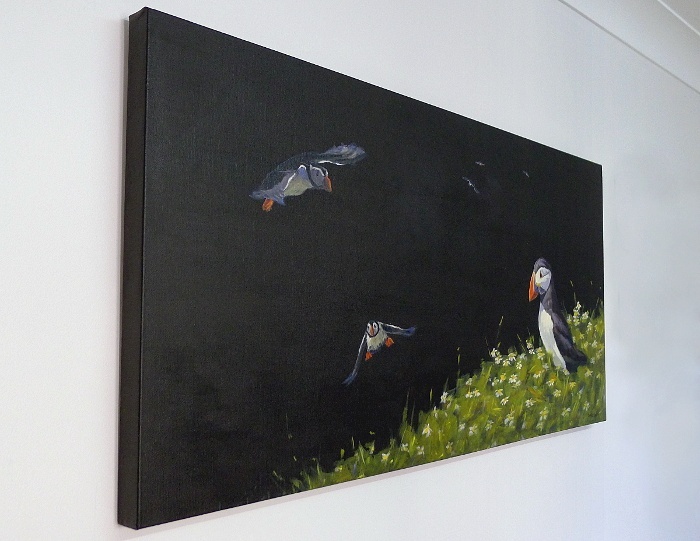 Original panoramic puffin painting in oils, inspired by the Puffins of Skomer Island, which is situated off the coast here in West Wales. You can take a day-trip over to Skomer to see the puffins, boats depart from Martin’s Haven daily at 10am, 11am and 12 noon (1st April – 30th September) - Find out more about visiting Skomer Island here, I highly recommend it! Painted on box canvas, 40 inch x 20 inch x 1.5 inch - This painting can be framed, or hung un-framed as shown.